Adaptation refers to action to prepare for and adjust to new conditions, thereby reducing harm or taking advantage of new opportunities. Adaptation planning is occurring in the public and private sectors and at all levels of government but few measures have been implemented. Explore adaptation to climate change. Climate change affects human health, natural ecosystems, built environments, and existing social, institutional, and legal arrangements. Adaptation considerations include local, state, regional, national, and international issues. For example, the implications of international arrangements need to be considered in the context of managing the Great Lakes, the Columbia River, and the Colorado River to deal with drought.2,125 Both “bottom up” community planning and “top down” national strategies4 may help regions deal with impacts such as increases in electrical brownouts, heat stress, floods, and wildfires. Such a mix of approaches will require cross-boundary coordination at multiple levels as operational agencies integrate adaptation planning into their programs. Adaptation actions can be implemented reactively, after changes in climate occur, or proactively, to prepare for projected changes.4 Proactively preparing can reduce the harm from certain climate change impacts, such as increasingly intense extreme events, shifting zones for agricultural crops, and rising sea levels, while also facilitating a more rapid and efficient response to changes as they happen. This chapter highlights efforts at the federal, regional, state, tribal, and local levels, as well as initiatives in the corporate and non-governmental sectors to build adaptive capacity and resilience in response to climate change. While societal adaptation to climate variability is as old as civilization itself,229 the focus of this chapter is on preparing for unprecedented human-induced climate change through adaptation. A map of illustrative adaptation activities and four detailed case examples that highlight ongoing adaptation activity across the U.S. are provided in Section 4 of this chapter. Adapt, Adaptation: Adjustment in natural or human systems to a new or changing environment that exploits beneficial opportunities or moderates negative effects. Adaptive Capacity: The potential of a system to adjust to climate change (including climate variability and extremes) to moderate potential damages, take advantage of opportunities, and cope with the consequences. Mitigation: Technological change and substitutions that reduce resource inputs and emissions per unit of output. Although several social, economic, and technological actions would reduce emissions, with respect to climate change, mitigation means implementing actions to reduce greenhouse gas emissions or increase the amount of carbon dioxide absorbed and stored by natural and man-made carbon sinks (see Ch. 27: Mitigation). Multiple Stressors: Stress that originates from different sources that affect natural, managed, and socioeconomic systems and can cause impacts that are compounded and sometimes unexpected. An example would be when economic or market stress combines with drought to negatively impact farmers. Risk: A combination of the magnitude of the potential consequence(s) of climate change impact(s) and the likelihood that the consequence(s) will occur. Vulnerability: The degree to which a system is susceptible to, or unable to cope with, adverse effects of climate change, including climate variability and extremes. Vulnerability is a function of the character, magnitude, and rate of climate variation to which a system is exposed, its sensitivity, and its adaptive capacity. *Definitions adapted from (IPCC 2007;15 NRC 2007,16 20104). A central component of the process were bi-weekly technical discussions held from October 2011 to June 2012 via teleconference that focused on collaborative review and summary of all technical inputs relevant to adaptation (130+) as well as additional published literature, the iterative development of key messages, and the final drafting of the chapter. An in-person meeting was held in Washington, D.C., in June 2012. Meeting discussions were followed by expert deliberation of draft key messages by the authors and targeted consultation with additional experts by the lead author of each key message. Consensus was reached on all key messages and supporting text. The key message and supporting text summarize extensive evidence documented in the peer-reviewed literature as well as the more than 130 technical inputs received and reviewed as part of the Federal Register Notice solicitation for public input. Additional citations are used in the text of the chapter to substantiate this key message. Numerous peer-reviewed documents describe adaptation barriers (see Table 28.7). Moreover, additional citations are used in the text of the chapter to substantiate this key message. Literature submitted for this assessment, as well as additional literature reviewed by the author team, supports the message that a significant amount of activity that has climate adaptation value is initiated for reasons other than climate preparedness and/or has other co-benefits in addition to increasing preparedness to climate and weather impacts.4,8,5,11,12 In recognition of this and other factors, a movement has emerged encouraging the integration of climate change considerations into existing decision-making and planning processes (i.e., mainstreaming).13,4,14 The case studies discussed in the chapter amplify this point. Numerous peer-reviewed publications indicate that no comprehensive adaptation evaluation metrics exist, meaning that no substantial body of literature or guidance materials exist on how to thoroughly evaluate the success of adaptation activities.4,19,20,21 This is an emerging area of research. A challenge of creating adaptation evaluation metrics is the growing interest in mainstreaming; this means that separating out adaptation activities from other activities could prove difficult. Federal agencies are all required to plan for adaptation. Actions include coordinated efforts at the White House, regional and cross-sector efforts, agency-specific adaptation plans, as well as support for local-level adaptation planning and action. Table 28.1 lists examples, but is not intended as a comprehensive list. All Federal Agencies Developed Adaptation Plans as part of their annual Strategic Sustainability Performance Plans The 2012 Strategic Sustainability Performance Plans for Federal agencies contain specific sections on adaptation. Agencies are required to evaluate climate risks and vulnerabilities to manage both short- and long-term effects on missions and operations. Department of Health and Human Services (HHS) Centers for Disease Control and Prevention (CDC) Climate-Ready States and Cities Initiative Through their first climate change cooperative agreements in 2010, CDC awarded $5.25 million to ten state and local health departments to assess risks and develop programs to address climate change related challenges. Department of Agriculture (USDA) Integrating climate change objectives into plans and networks USDA is using existing networks such as the Cooperative Extension Service, the Natural Resource Conservation Districts, and the Forest Service's Climate Change Resource Center to provide climate services to rural and agricultural stakeholders. USDA Forest Service Developed a National Roadmap for Responding to Climate Change and a Guidebook for Developing Adaptation Options, among many resources The National Roadmap was developed in 2010 to identify short- and long-term actions to reduce climate change risks to the nation's forests and grasslands. The Guidebook builds on this previous work and provides science-based strategic and tactical approaches to adaptation. Department of Commerce (DOC) NOAA Supporting research teams and local communities on adaptation-related issues and develops tools and resources Through the Regional Integrated Sciences and Assessments (RISAs) program, develop collaboration between researchers and managers to better manage climate risks. Through the Regional Climate Centers (RCCs) and the Digital Coast partnership, deliver science to support decision-making. Department of Defense (DoD) Developed a DoD Climate Change Adaptation Roadmap DoD released its initial Department-level Climate Change Adaptation Roadmap in 2012. The Roadmap identifies four goals that serve as the foundation for guiding the Department’s response to climate change that include using a robust decision making approach based on the best available science. DoD U.S. Army Corps of Engineers (USACE), Civil Works Program Developed climate change adaptation plan; making progress in priority areas including vulnerability assessments and development of policy and guidance The USACE Civil Works Program initial climate change adaptation plan in 2011 has a goal to reduce vulnerabilities and improve resilience of water resources infrastructure impacted by climate change. Vulnerability assessments and pilot projects are in progress. Other guidance is underway. DoD Department of the Navy Developed road maps for adaptation in the Arctic and across the globe The Navy Arctic Roadmap (November 2009) promotes maritime security and naval readiness in a changing Arctic. The Climate Change Roadmap (May 2010) examines broader issues of climate change impacts on Navy missions and capabilities globally. Department of Energy (DOE) Develop higher spatial and temporal scales of climate projections and integrate adaptation and climate considerations into integrated assessments Develops community-based, high-resolution (temporal and spatial) models for climate projections and integrated assessment models that increasingly reflect multi-sectoral processes and interactions, multiple stressors, coupled impacts, and adaptation potential. DOE Developed climate change adaptation plan, and completed comprehensive study of vulnerabilities to the energy sector of climate change and extreme weather The 2013 DOE Report "U.S. Energy Sector Vulnerabilities to Climate Change and Extreme Weather" examines current and potential future impacts of climate trends and identifies activities underway and potential opportunities to enhance energy system climate preparedness and resilience. Department of Homeland Security (DHS) Federal Emergency Management Agency (FEMA) Works with communities across the Nation to help them prioritize their activities to reduce risks FEMA released a Climate Change Adaptation Policy Statement establishing the Agency’s approach to supporting the Department in ensuring resilience to disasters in the face of climate change. FEMA’s action areas focus on developing actionable "future risk" tools, enabling state and local adaptation, and building resilience capabilities. Department of the Interior (DOI) Fish and Wildlife Service (FWS) Developed a FWS climate change strategic plan (2010) and established a network of Landscape Conservation Cooperatives (LCCs) Established a framework to help ensure the sustainability of fish, wildlife, plants, and habitats in the face of climate change. Created a network of 22 LCCs to promote shared conservation goals, approaches, and resource management planning and implementation across the United States. DOI U.S. Geological Survey (USGS) Established a network of Climate Science Centers (CSCs) DOI operates a National Climate Change and Wildlife Center and eight regional CSCs, which provide scientific information and tools that land, water, wildlife, and cultural resource managers and other stakeholders can apply to anticipate, monitor, and adapt to climate change. DOI National Park Service (NPS) Climate Change Response Strategy (2010), Climate Change Action Plan (2012), and Green Parks Plan (2012) NPS actions span climate change science, adaptation, mitigation, and communication across national parks, including exhibits for park visitors, providing climate trend information for all national parks, risk screening and adaptation for coastal park units, and implementing scenario planning tools. DOI Bureau of Land Management (BLM) Rapid Ecoregional Assessments (REAs) REAs synthesize information about resource conditions and trends within an ecoregion; assess impacts of climate change and other stressors; map areas best-suited for future development; and establish baseline environmental conditions, against which to gauge management effectiveness. Department of Transportation (DOT) Federal Highway Administration (FHWA) Developed Risk Assessment Model for transportation decisions DOT worked with five local and state transportation authorities to develop a conceptual Risk Assessment Model to identify which assets are: a) most exposed to climate change threats and/or b) associated with the most serious potential consequences of climate change threats. Completed November 2011. DOT Comprehensive study of climate risks to Gulf Coast transportation infrastructure followed by in-depth study of Mobile, AL Phase 1 of the 2008 study assessed transportation infrastructure vulnerability to climate change impacts across the Gulf. Phase 2, to be completed in 2013, focuses on Mobile, AL. This effort will develop transferable tools for transportation planners. Environmental Protection Agency (EPA) Established the Climate Ready Estuaries program, the Climate Ready Water Utilities initiative, and a tribal climate change adaptation planning training program These selected EPA initiatives provide resources and tools to build the capacity of coastal managers, water utilities, and tribal environmental professionals to plan for and implement adaptation strategies. National Aeronautics and Space Administration (NASA) Initiated NASA’s Climate Adaptation Science Investigator (CASI) Workgroup to partner NASA scientists, engineers, and institutional stewards The CASI team builds capacity to address climate change at NASA facilities by downscaling facility-specific climate hazard information and projections; conducting customized climate research for each location; and leading resilience and adaptation workshops that spur community-based responses. Table 28.1: *Material provided in table is derived directly from Agency representatives and Agency websites. These are select examples and should not be considered all-inclusive. States have become important actors in national climate change related efforts. State governments can create policies and programs that encourage or discourage adaptation at other governance scales (such as counties or regions)44,45 through regulation and by serving as laboratories for innovation.46,47 Although many of these actions are not specifically designed to address climate change, they often include climate adaptation components. 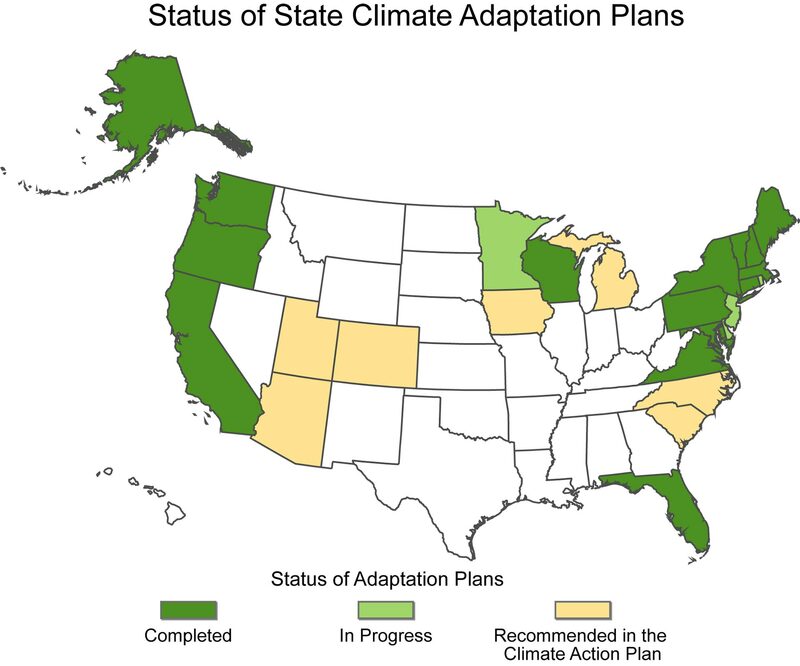 In addition to formal adaptation plans, numerous states have created sector-specific plans that consider long-term climate change (Figure 28.1). For example, at least 16 states have biodiversity conservation plans that focus on preparing for long-term changes in climate.48 In addition to planning, some states have created legislation and/or programs that are either directly or indirectly targeted at reducing climate vulnerabilities (Table 28.2). Maryland Passed Living Shorelines Act to reduce hardened shorelines throughout the state;41 passed “Building Resilience to Climate Change” policy which establishes practices and procedures related to facility siting and design, new land investments, habitat restoration, government operations, research and monitoring, resource planning, and advocacy. Montana Maintains a statewide climate change website to help stakeholders access relevant and timely climate information, tools, and resources. Rhode Island Requires public agencies considering land-use applications to accommodate a 3- to 5-foot rise in sea level. Table 28.2: *This list contains selected examples of state-level adaptation activities and should not be considered all-inclusive. 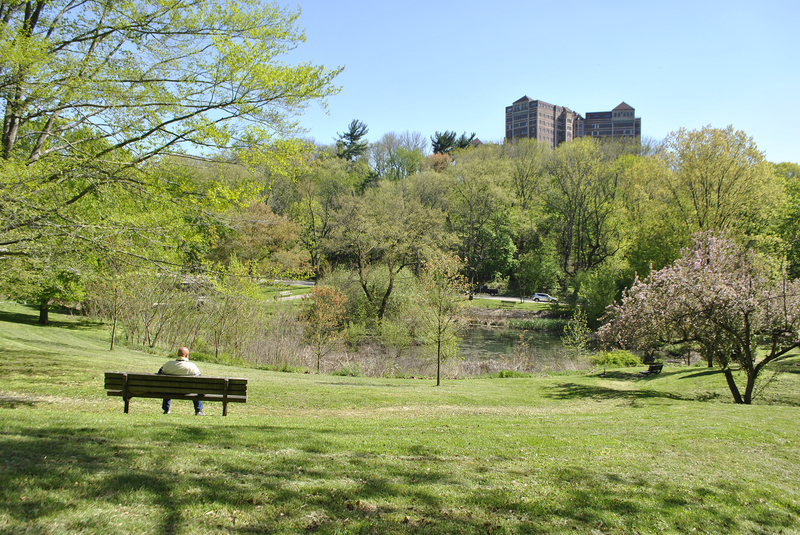 This one-acre stormwater wetland was constructed in Philadelphia to treat stormwater runoff in an effort to improve drinking water quality while minimizing the impacts of storm-related flows on natural ecosystems. Table 28.4: * This list contains examples of private sector actions to adapt to climate risks as reported to the Carbon Disclosure Project and should not be considered all-inclusive or a validation of actions claimed by the organizations. Constellation Brands Consumer Staples Changes in physical climate parameters; Changes in other climate-related developments Constellation has already taken adaptation actions, particularly in California where water availability is an issue, to manage or adapt to these risks. Constellation is working with numerous organizations to help fund industry-based research to determine potential climate change impacts on vineyard production. *This list contains examples of private sector actions to adapt to climate risks as reported to the Carbon Disclosure Project and should not be considered all-inclusive or a validation of actions claimed by the organizations. This is not a stepwise or linear process; various stages can be occurring simultaneously, in a different order, or be omitted completely. 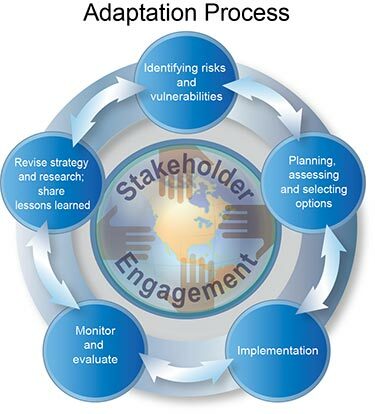 However, as shown clockwise in Figure 28.3, the process generally involves characterizing vulnerability, developing options, implementing actions, monitoring outcomes, and reevaluating strategies. Each of these is described in more detail below. Once risks and vulnerabilities are understood, the next stage typically involves identifying, evaluating, and selecting options for responding to and managing existing and future changes in the climate.10 Decision support planning methods and associated tools help to identify flexible and context-relevant adaptation activities for implementation.4,83 Participatory approaches support the integration of stakeholder perspectives and context-specific information into decision-making.94,95,11,96 This approach can include having community members and governing institutions work collectively to define the problem and design adaptation strategies that are robust while being sensitive to stakeholder values.11,97,98,99 Moreover, regional collaboration has emerged as an effective strategy for defining common approaches to reducing potential threats, selecting metrics for tracking purposes, and creating governance structures to help navigate political challenges.60,100,101,102 As discussed above, a number of government and other organizations have developed plans with identified adaptation options. Despite barriers, individuals within and across sectors and regions are organizing to collectively overcome barriers and adapt to climate change. In many cases, lessons learned from initial programs help inform future adaptation strategies. 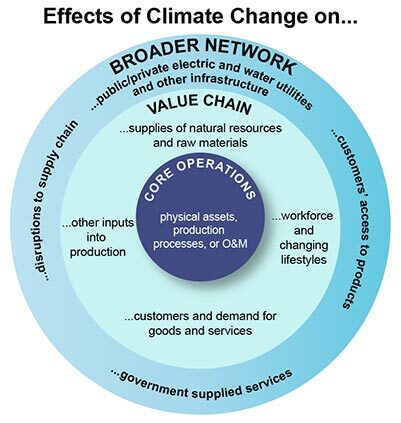 Figure 28.4 highlights ongoing climate adaptation activities that have overcome some of these barriers in different regions led by state, local, and private actors in the United States. It is not a comprehensive compilation of national adaptation activity, but is intended to identify some of the variety of adaptation efforts taking place across the country. In addition, Section 4 of this chapter provides four in-depth case studies of climate adaptation strategies at different scales, with multiple stakeholders, and tackling different challenges. Each of these case studies highlights the different ways stakeholders are approaching adaptation. Through the creation of the National Integrated Drought Information System (NIDIS), the Federal Government, in partnership with the National Drought Mitigation Center (NDMC), states, tribes, universities, and others, has improved capacity to proactively manage and respond to drought-related risks and impacts through: 1) the provision of drought early warning information systems with local/regional input on extent, onset, and severity; 2) a web-based drought portal featuring the U.S. Drought Monitor and other visualization tools; 3) coordination of research in support and use of these systems; and 4) leveraging of existing partnerships, forecasting, and assessment programs. In the Colorado River Basin, water resource managers, government leaders, federal agencies, tribes, universities, non-governmental organizations (NGOs), and the private sector are collaborating on strategies for managing water under a changing climate through partnerships like the Western Governors’ Association (WGA) and WestFAST (Western Federal Agency Support Team). 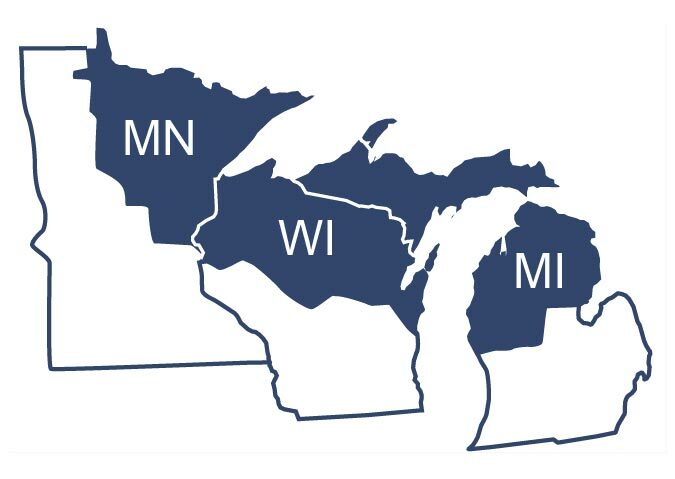 In Wisconsin, the Northern Institute of Applied Climate Science and the U.S. Forest Service, working with multiple partners, initiated a “Climate Change Response Framework” integrating climate-impacts science with forest management. In Cape Cod, Massachusetts, the U.S. Department of Transportation’s Volpe Center worked with federal, regional, state, and local stakeholders to integrate climate change mitigation and adaptation considerations into existing and future transportation, land-use, coastal, and hazard-mitigation processes. Adaptation to climate change is in a nascent stage. The Federal Government is beginning to develop institutions and practices necessary to cope with climate change, including efforts such as regional climate centers within the U.S. Department of Agriculture, the National Oceanic and Atmospheric Administration (a division of the U.S. Department of Commerce), and the U.S. Department of the Interior. While the Federal Government provides financial assistance in federally-declared disasters, it is also enabling and facilitating early adaptation within states, regions, local communities, and the public and private sectors.4 The approaches include working to limit current institutional constraints to effective adaptation, funding pilot projects, providing useful and usable adaptation information – including disseminating best practices and helping develop tools and techniques to evaluate successful adaptation. Despite emerging efforts, the pace and extent of adaptation activities are not proportional to the risks to people, property, infrastructure, and ecosystems from climate change; important opportunities available during the normal course of planning and management of resources are also being overlooked. A number of state and local governments are engaging in adaptation planning, but most have not taken action to implement the plans.184 Some companies in the private sector and numerous non-governmental organizations have also taken early action, particularly in capitalizing on the opportunities associated with facilitating adaptive actions. Actions and collaborations have occurred across all scales. At the same time, barriers to effective implementation continue to exist (see Section 2). Effective adaptation will require ongoing, flexible, transparent, inclusive, and iterative decision-making processes, collaboration across scales of government and sectors, and the continual exchange of best practices and lessons learned. All stakeholders have a critical role to play in ensuring the preparedness of our society to extreme events and long-term changes in climate. NIDIS (National Integrated Drought Information System), originally proposed by the Western Governors’ Association (WGA) and established by Congress in 2006,196 is a federally-created entity that improves the nation’s capacity to proactively manage drought-related risks across sectors, regions, and jurisdictions. It was created by Congress to “enable the Nation to move from a reactive to a more proactive approach to managing drought risks and impacts.” NIDIS has successfully brought together government partners and research organizations to advance a warning system for drought-sensitive areas. The creation of NIDIS involved many years of development and coordination among federal, state, local, regional, and tribal partners with the help of Governors’ associations and Senate and Congressional leaders. NIDIS provides: 1) drought early warning information systems with regional detail concerning onset and severity; 2) a web-based portal (www.drought.gov); 3) coordination of federal research in support of and use of these systems; and 4) leveraging of existing partnerships and of forecasting and assessment programs. NIDIS currently supports work on water supply and demand, wildfire risk assessment and management, and agriculture. Regional drought early warning system pilot projects have been established to illustrate the benefits of improved knowledge management, improved use of existing and new information products, and coordination and capacity development for early warning systems. These prototype systems are in the Upper Colorado Basin, the Apalachicola-Chattahoochee-Flint River Basin in the Southeast, the Four Corners region in the Southwest, and California. The NIDIS Outlook in the Upper Colorado Basin provides early warning information every week, for example, that is utilized by a variety of users from federal agencies, water resource management, and the recreation industry. 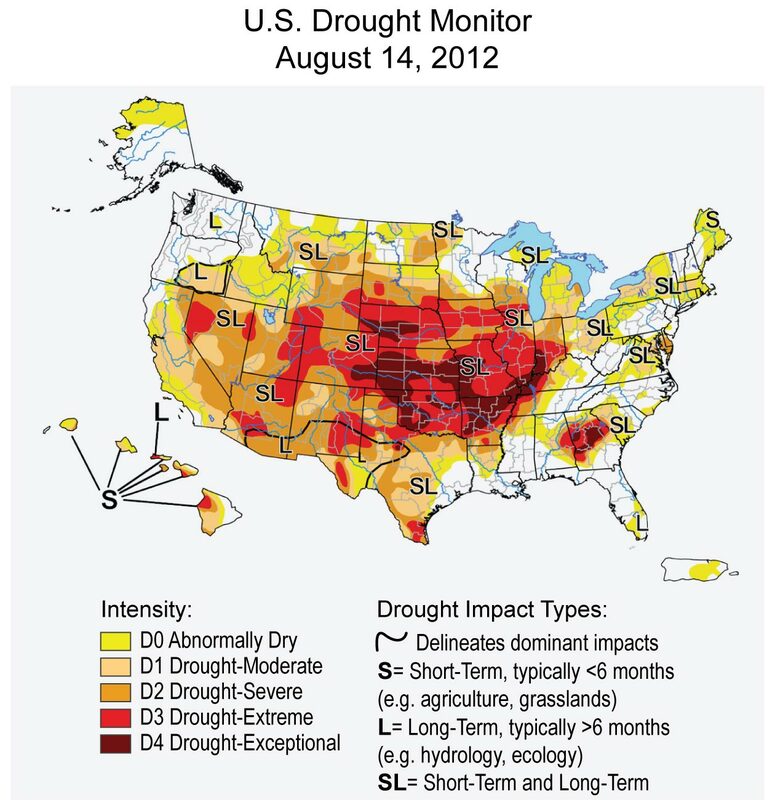 Usable Technology and Information for Decision Support: The production of the U.S. Drought Monitor map, which integrates multiple indicators and indices from many data sources, was developed before NIDIS was established and has become a useful visual decision support tool for monitoring and characterizing drought onset, severity, and persistence. NIDIS has engaged regional and local experts in refining the regional details of this national product and in “ground truthing” maps via email discussions and webinars (Figure 28.5). Financial Assistance: Federal funding was allocated to NOAA specifically for NIDIS, but leveraged in kind by other agencies and partners. Institutional/Policy: The NIDIS Act was oriented toward the improvement of coordination across federal agencies and with regional organizations, universities, and states. It focused on the application of technology, including the Internet, and on impact assessments for decision support. A key aspect of NIDIS is the development of an ongoing regional outlook forum based on the above information to build awareness of the drought hazard and to embed information in planning and practice (in partnership with the National Drought Mitigation Center, the Regional Integrated Sciences and Assessments (RISA), and other research-based boundary organizations) to reduce risks and impacts associated with drought. Leadership and Champions: NIDIS supporters worked at all levels over more than two decades (1990s and 2000s) to establish the NIDIS Act, including political groups (WGA, Southern Governors’ Association, National Governors Association, and U.S. Senators and Representatives), scientific leaders, and federal agencies (NOAA, USDA, DOI). The Colorado River supplies water and valuable ecosystem services to 33 million people and is vulnerable to climate change because of decreases in mountain snowpack and water availability, increased competition among water users, fires, drought, invasive species, and extended extreme heat events, among other threats.2,199,200,201,202,203 The 1922 Colorado River Compact, which allocates water among seven U.S. states and Mexico, was agreed upon in a particularly wet time period;204,205 thus the river water is already over-allocated for current conditions. Given the likelihood of having less water because of climate change, resource managers and government leaders are increasingly recognizing that water must be managed with flexibility to respond to the projected impacts and the range of possible future climates (see Ch. 2: Our Changing Climate; Ch. 3: Water).2,206 Multiple actors across multiple disciplines, scales of governance (including tribal, local, state, and federal), non-governmental organizations, and the private sector are organizing and working together to address these concerns and the relationship between climate and other stresses in the basin. The Western Governors’ Association (WGA) spearheaded adaptation efforts to enable federal, state, tribal, local, and private sector partners to address a range of issues, including climate change.2,206,207,208,209 For example, the Western Federal Agency Support Team (WestFAST), which was established in 2008, created a partnership between the Western States Water Council (WSWC) and 11 federal agencies with water management responsibilities in the western United States. The agencies created a work plan in 2011 to address three key areas: 1) climate change; 2) water availability, water use, and water reuse; and 3) water quality. To date they have produced the WestFAST Water-Climate Change Program Inventory, the Federal Agency Summary, and a Water Availability Studies Inventory (www,westgov.org). A series of adaptation demonstrations was initiated to showcase ground-level implementation. The Framework and adaptation workbook provide a common process shared by diverse landowners and a formal network that supports cross-boundary discussion about different management objectives, ecosystems, and associated adaptation tactics. Define the purpose and scope of the Framework and its components early, but allow for refinement to take advantage of new opportunities. Begin projects with a synthesis of existing information to avoid duplicating efforts. Plan for the extra time necessary to implement true collaboration. Carefully match the skills, commitment, and capacity of people and organizations to project tasks. Maintain an atmosphere of trust, positivity, and sense of adventure, rather than dwelling on failures. Recognize the necessity of effective communication among people with different goals, disciplinary backgrounds, vocabulary, and perspectives on uncertainty. Integrate the ecological and socioeconomic dimensions early by emphasizing the many ways that communities value and depend on forests. Use technology to increase efficiency of internal communication and collaboration, as well as outreach. The Framework brings scientists and land managers together to assess the vulnerability of ecosystems based on scientific information and experience in order to plan adaptation actions that meet management goals. On-the-ground implementation has just begun, and an increased focus on demonstrations, monitoring, and evaluation will inform future adaptation efforts. Once the preliminary scenarios were developed, a workshop was convened in which community and transportation planners, environmental managers, and Cape Cod National Seashore stakeholders selected areas for development and transit improvements to accommodate new growth while meeting the goals of reduced heat-trapping gas emissions, increased resilience to climate change, and the conservation of natural systems.221 Through interactive visualization tools, participants were able to see in real-time the impacts of their siting decisions, allowing them to evaluate synergies and potential tradeoffs of their choices and to highlight areas where conflict could or already does exist, such as increasing density of development in areas already or likely to be vulnerable to climate change.224 As a result, the stakeholders developed a refined transportation and land-use scenario that will support the region’s long-range transportation planning as well as other local, regional, and state plans. This updated scenario identifies strategies that have climate adaptation and mitigation value, helping to ensure that the region simultaneously reduces its heat-trapping gas footprint while building resilience to existing and future changes in climate.220,221 The overall success of the pilot project stemmed from the intensive stakeholder interaction at each phase of the project (design, implementation, and evaluation).